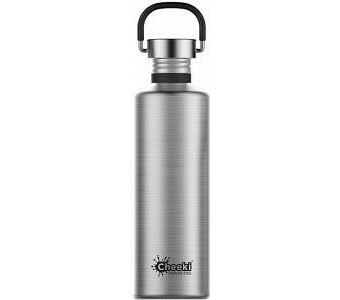 Cheeki’s classic 750mL bottle is made from premium 304 (18/8) stainless steel with a rounded single-mould design that makes it extremely durable and resistant to breakage. Inside, your water stays pure and pleasant-tasting thanks to an unlined interior and a BPA-free silicone seal that means it never touches plastic. Outside, the bottle is fitted with a comfortable rubber carry handle and attractively finished with nontoxic paint. Choose a colour and hit the road, the gym, the trail or the beach with the hydration you need and the ecofriendly style you’ll love to show off!